Children of the Atom, soldiers for their cause, whether it be for mankind's survival or it's demise, they are hated and feared for no other reason than being born different. Out of this turmoil, the world's most powerful telepath, Charles Xavier, tries to lead humanity towards the path of peace and tolerance. Aiding him in the struggle are his champions, The X-Men, mutants believing firmly in Xavier's dream of a better tomorrow for all man and mutant-kind. Apocalypse is the evil mutant who has used his sinister genius and mutant ability to turn himself into a merciless one man army! 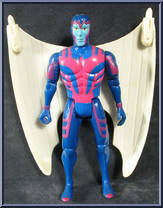 Apocalypse is incredibly strong, able to change his size at will, and h. . .
Archangel is the high-flying X-Man with a knock-out secret weapon-- wingtip darts filled with paralyzing fluid! Archangel can fire these darts with uncanny accuracy from any height and speed. With h. . . The strongest of the X-Men, Colossus has the awesome mutant ability to turn his body into living steel! 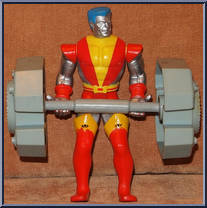 When he is in his living steel form, Colossus can lift as many as forty cars at once. His stee. . .
Co-leader of the X-Men, cool in combat and a master of strategy. Cyclops is the one member the X-Men count on to hold the team together and create a winning plan when the odds for success seem hopele. . .
Incredibly strong, virtually invulnerable, and with a body almost bursting with evil mutant power, Juggernaut is the ultimate mutant battering ram. Juggernaut is unstoppable... he can smash his way t. . . The evil mutant master of magnetism, Magneto is the arch-enemy of the X-Men. With his magnetic power, Magneto's magnetic force can pull even the heaviest objects to him, throw them miles away, or cau. . .
Nightcrawler is the X-man with the most amazing mutant ability - teleportation! Nightcrawler can instantaneously move himself to a spot up to three miles away in the blink of an eye. Nightcrawler is . 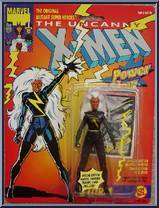 . .
Super-villains have learned that this co-leader of the X-Men is perhaps the most dangerous X-Man of all because Storm has the amazing mutant power to control weather! With a quick mental command, Sto. . . When it comes to fighting Evil Mutants, the X-Men know there's no one better than Wolverine! 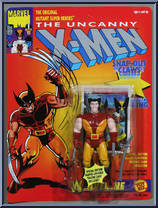 With his razor-sharp adamantium claws, his lightning-quick reflexes and his unmatched combat experience, Wo. . .